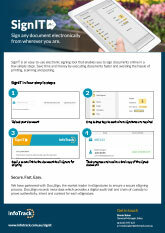 SignIT is an easy-to-use electronic signing tool that enables you to sign documents online in a few simple steps. SignIT it saves you time and money by allowing you to execute documents faster and avoid the hassle of printing, scanning and posting. We've partnered with trusted industry expert DocuSign to ensure a simple and secure signing process. SignIT allows you to upload any document and send it to parties via a secure email link. 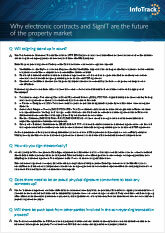 Parties can then review and sign the document online from any location. You can track who has signed the document on the SignIT dashboard and once all parties have executed, everyone receives a final signed copy. This saves all parties time and improves the user experience. With its watertight security, InfoTrack’s eSigning tool SignIT is safer than paper. For even more added security, you can now add SMS verification to your SignIT process. Once a document is uploaded, signers are chosen and tags affixed, you can select to have SMS authentication. When signatures have been requested and the email accessed by the recipient, they will be prompted to select the mobile number and ‘send SMS’. An authentication code will be sent to the provided mobile number, which can then be entered to enable access to the document for signing. Want to know more about e-Signing? We’ve put together a quick quide to show you just how easy it is to use electronic signing. Do you have questions about e-Signing? Both the NSW and Victorian governments have announced timelines to transition to 100% digital conveyancing by July 2019. We've got the tools to help you go 100% digital. No need to mail or email the document to complete the transaction. Full transparency and control through the SignIT dashboard. Upload any document for execution in one click on our easy-to-use system. Ease of signing creates a better experience for clients and practitioners. No need to print, compare, sign and scan physical copies of the documents. View which parties have signed the document on the SignIT dashboard. Once the document is executed, all parties receive a copy of the signed and dated document via email. Tracked by the latest technology with a DocuSign audit trail report provided post transaction.